This Beautiful and Historically significant Gibson White Les Paul Custom Guitar is The Les Paul White Custom from the cover of Les Paul's Autobiography "In His Own Words" and many other promotional photos from that time… 100% Authenticated. No ifs, ands, or buts about it… We have been contacted by the former Gibson Artist Relations Rep who gave Les this guitar and he also affirms this to be "THE GUITAR". This guitar was especially made for Les Paul himself as a special gift to the Master from The Gibson Custom Shop in 2002, commemorating 50 years from the time Gibson made the very first Les Paul Guitar in 1952. EVERY INDIVIDUAL FROM LES' INNER CIRCLE AND THE PEOPLE 'IN-THE-KNOW' AT GIBSON USA ALL KNOW WHAT THIS GUITAR IS, AND HAVE CONTACTED US - WE ARE TRULY HONORED TO NOW OWN THIS PIECE... THIS IS YOUR CHANCE TO OWN A PIECE OF HISTORY! THIS GUITAR WAS GIVEN TO LES BY GIBSON COMMEMORATING THEIR 50 YEARS TOGETHER! We have contacted the photographer that took the photos for the autobiography and affirms this to be THE GUITAR. 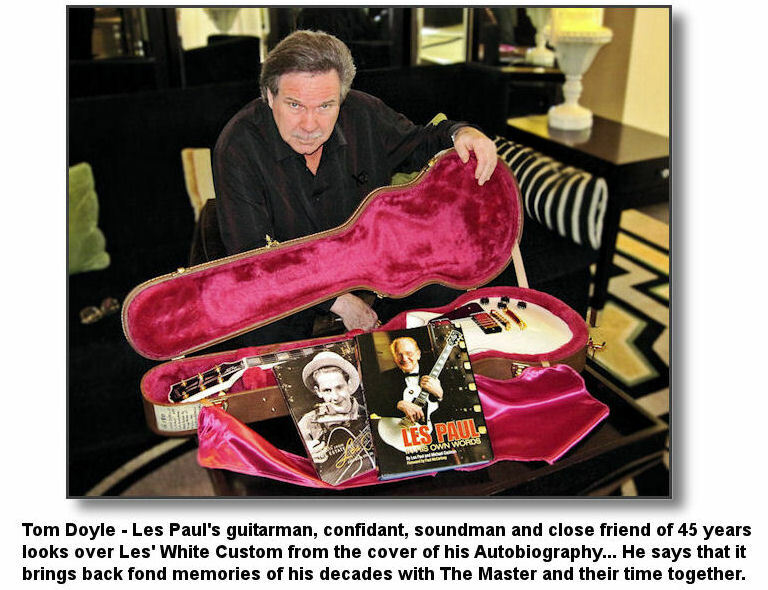 He spent 10 days with Les in his home, and following him everywhere for that time period and knows this guitar well. You see… this guitar has been re-fretted by Gibson for Les’ personal tastes… and as you already most likely know, a factory fret job has the binding over the frets, and with a post facto re-fret job the frets will be above the binding and there will be no binding on the frets. Take a good look at the guitar in all of the photos (here and on the website) and the guitar from the book. Also a keen eye will notice the inlays – their shape, color, patterns, characteristics and so on… they match perfectly. More importantly Tom Doyle - Les' personal luthier, guitar-tech, collaborator, sound engineer of 45 years has inspected this guitar carefully, its case, Les' internal notes and numbering system and markups, etc... and certifies its provenance and authenticity. I know Tom Doyle personally, have been to his home, his shop, used to go to Fat Tuesdays on Monday nights with him to go watch Les play (back in the day). I even had the opportunity to meet Les a few times at Tom’s shop, and Tom brought us over to Les’ home to visit with him back in the 80’s. Do you know who Tom Doyle is? If not, please use your Google and find out. 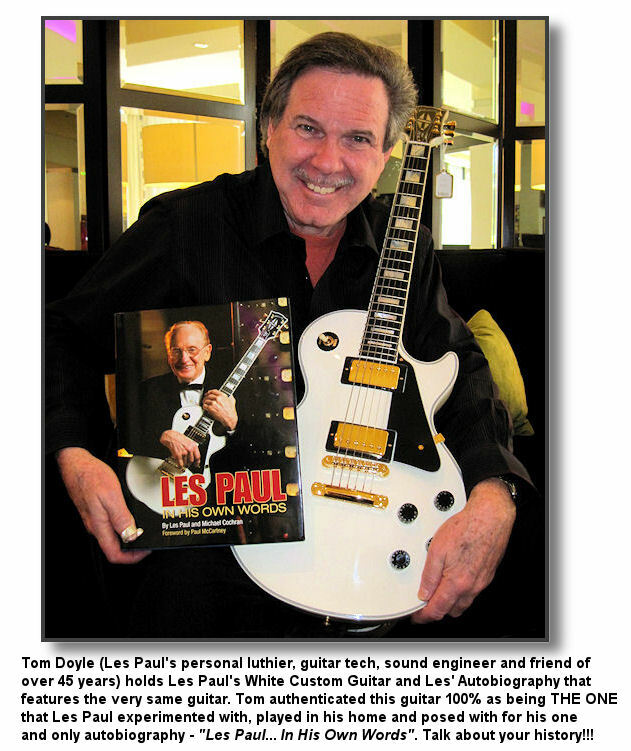 Tom has been Les Paul’s personal friend, personal luthier and guitar-tech, sound engineer, and consultant for 45 years… a constant companion, helper, co-designer, tech, and more importantly, his good friend. Tom inspected this guitar and 100% affirms and certifies this instrument as the guitar Les used all the time for practicing in his home, playing and experimenting with different high impedance pickups with and the guitar he personally chose to use for the cover of his autobiography, “Les Paul – In His Own Words” as an homage to Gibson and commemorating their working together for 50 years! There was no doubt, he was 100% sure. We also received a provenance and authenticity letter from "Frankie B." of First Fret Guitars in NJ - A gentleman that has known Les Paul since he was 11 years old. Les gave Frankie his very first guitar when he was just a boy, and Frank was called in to do many of the appraisals for Les' Estate when he passed away. Frankie writes: "I know this guitar - known as G180 The White Custom... I know it to be the right guitar... Now and into the future, this instrument is and will forever be priceless because of its special connection with Les Paul, his relationship with Gibson, and the fact that it was used for the cover of his autobiography". Lastly, when we contacted the people at "The Property From The Estate of Les Paul" to discuss this guitar and make arrangements for its delivery and so on… One of the curators we spoke to interrupted by saying, “ Wow! Do you know what guitar you just bought? This is the guitar on the cover of Les’ Autobiography!! !” And the answer was YES... I did know that! This guitar is very special, very important, has perfect provenance... and will prove to be very important in the grand scheme of things as Les Paul’s personal guitar, a special gift from Gibson USA celebrating their 50 years of working together - THE ONE that he chose to use for the cover of his one and only autobiography. The folks at EBay's main headquarters in San Jose were so very impressed and intrigued by this rare and collectable piece of Les Paul History and how this guitar came to be discovered... They wrote a story about it! ● Deluxe Edition Hardcover Autobiography "Les Paul In His Own Words"
This guitar was owned and played regularly by Lester William Polsfuss… known to most around the world as Les Paul, to his friends as “Red”. The inventor of the modern electric solid body guitar. This guitar was not just part of his personal collection... 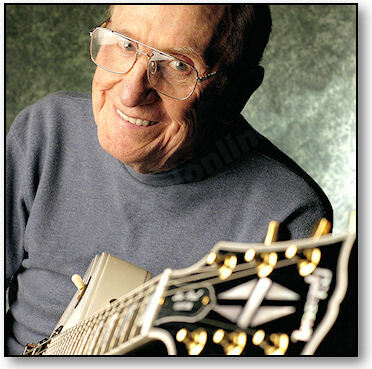 He liked and played it so much that posed with it for the cover of his Official Biography, “Les Paul – In His Own Words”. 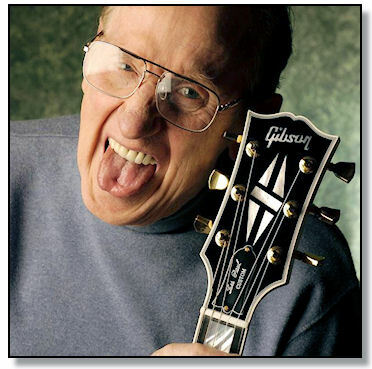 Les Paul spent weeks sitting with Michael Cochran telling about his life. Learn about the invention and creativity of Les Paul who began his career when he was 13 and who was still performing up to a few months before he died. 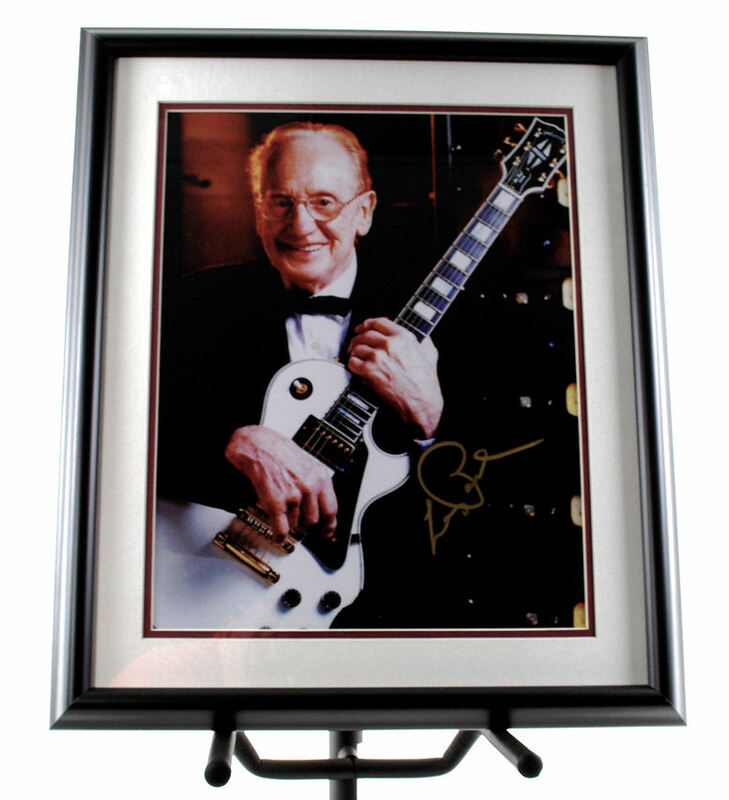 Cochran and Les Paul himself, capture the philosophy and thoughts of this pioneer in the solid body electric guitar, the inventor of multi-track recording as well as many other devices that transformed the music industry, and consummate performer and raconteur. Les Paul basically invented this solid body electric guitar that bears his name - and he not only revolutionized the sound of the electric guitar, but also the technology behind modern day sound recording. Les Paul pioneered innovative techniques with sound-on-sound recording and commissioned the first 8-track tape recorder, which would become the core technology behind multi-track recording still used today. The sale included property, equipment, memorabilia. and instruments that span the entirety of Paul’s career from his days as Rhubarb Red to his weekly Monday night concerts at the Iridium Jazz Club in New York City. Serial Number 00332400 - White with Gold Hardware, in its original Gibson Hardshell case, with Les Paul's personal guitar strap in the case. This guitar was played often and much by Les... he liked it so much so that he had it was re-fretted to his personal spec by the good people of Gibson's Artist Relations Department in New York City. Rated a 9 out of 10 by the curator. While Les had many guitars in his collection, he actually used and played this one regularly up until the time of his death in 2009. As you can see, it was featured on the cover of his Autobiography. It was kept in his personal bedroom...and played by Les quite often. The guitar is in its original condition and has not been cleaned... it still has the original strings, various smears, pick dust between the pickups, lightly scratched pickguard that shows its been played quite a bit, and a vintage patina from constant use and playing... Les Paul's DNA is all over this instrument. ● WILL SHIP WITH THREE BUSINESS DAYS ONCE PAYMENT RECEIVED! HURRY! - MAKE YOUR BEST OFFER NOW...THIS SPECIAL GUITAR WILL NOT LAST! In 1999 Mark McGwire's 70th home run baseball sold for 3 Million dollars. The second highest price paid for a piece of baseball memorabilia is the famous "Gretzky T206 Honus Wagner" baseball card selling for $2.8 million in 2007. Wayne Gretzky and Bruce McNall bought the T206 Honus Wagner card in 1991 for $451,000, and sold it for $500,000 in 1995. This guitar was the Leo Fender’s first prototype for the most popular guitar ever made (known as Fender Telecaster then). This particular model become a milestone of the world’s most successful electric guitar company. It was sold to private collector in 1994 for $375,000. The highest price ever paid for a guitar at that time. The guitar was ordered by Eric Clapton in 1996. It was around the 50th anniversary of Fender. Clapton wanted something that could hang in Louvre museum. The company answer with a custom fender plated with 23k gold. It’s then become the company’s first signature guitar. It was then sold in Christie’s auction in 1997 for impressive price of $455,000. This guitar was used by the Beatles between 1966 and 1969. George Harrison used it when recording and touring for the album “Revolver”. John Lennon used the same guitar during the sessions of “the White” album. 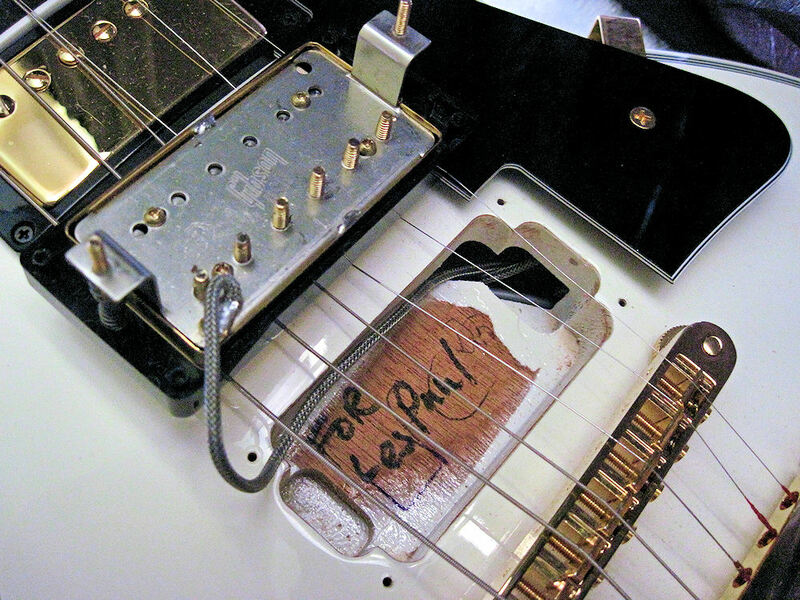 It was given to George Peter Ham, from the rock band Badfinger. After his death it was undiscovered until 2002. It was sold to an anonymous bidder at the auction in 2004 for a startling price of $570,000. Stevie Ray Vaughan, great blues guitarist, received the guitar from his wife, Lenny, in 1980 as 26th birthday present. The guitar named after her then. This guitar was the one of his favorite guitar and he used it many times until his death in 1990. The SRV sticker on the body of this guitar is a trademark for most of the guitar of Stevie Ray Vaughan. In 2004 it was sold in auction to benefit of the crossroad centre in Antigua for $623,500. Another guitar of Eric Clapton that “sold” to raise money for the Crossroads Rehabilitation Center. I guess there will be more guitars will be more expensive when they’re sold (owned by Jimmy Page, Van Halen, etc). This is the guitar that was used particularly by Eric Clapton during 1964, but just rarely used after that. It reached $847,500 when auctioned. It’s the highest price ever paid for a Gibson in auction. Because of the influence of other Guitarist, Jimi Hendrix, in 1970 Eric Clapton switch from Gibson to Stratocaster guitar. Clapton bought six vintage strats from guitar shop in Texas for a hundred dollar each. He gave 3 for George Harrison, Pete Townshend and Steve Winwood. Then he use the remaining three that he named Blackie. Clapton’s blackie was first played in January 1973 and continues to be played until 1985 when he is retired because of neck problems. Blackie sold at auction in 2004 and become one of the most expensive guitar for $959,000. This guitar is classified as national asset by the government of Jamaica. This guitar is one of the only seven guitars of the Reggae icon’s life. On November 21st, 1971, after a gig in Vancouver, Marley gave the guitar to a guitar technician Gary Carlsen with the words, “Take it as you will understand later”. Amazingly, Carlsen took this guitar for a gift for a better world. He then founded the Charity “Different Journeys, One Destination”, and offered the guitar as a prize in the lottery. This guitar was played by Jimi Hendrix at the Woodstock in 1969. From 1970 to 1990 it was in the hand of drummer Mitch Mitchell. It’s emerged again to the surface at the opening of new Fender artist center in 1990. It was then sold at Sotheby’s in the same year for $198,000. 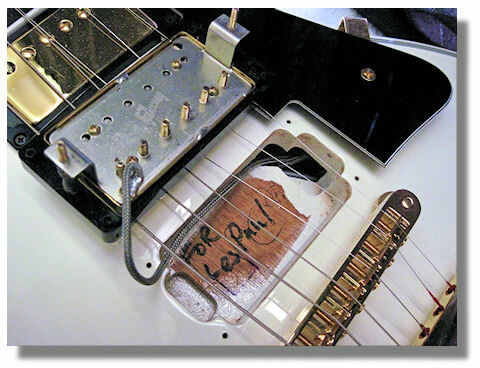 After that the rumors said that Paul Allen of Microsoft paid 2 million dollars for this guitar in 1998. This guitar sold in an auction held in Qatar in 2005 to raise fund for Reach Out to Asia, a Charity formed to help the tsunami victims. It was coordinated by Bryan Adams and was signed by Mick Jagger, Keith Richards, Eric Clapton, Brian May, Jimmy Page, David Gilmour, Jeff Beck, Pete Townsend, Mark Knopfler, Ray Davis, Liam Gallagher, Ronnie Wood, Tony Iommi, Angus & Malcolm Young, Paul McCartney, Sting, Ritchie Blackmore, Def Leppard and Bryan Adams himself. Initially was taken by Qatari royal family for $1 million and later donated as charity. Then It was sold again to a price of 2.7 million. Totally this guitar has yielded a total of $3.7 million dollars for charity.